Norfolk is my wife Rachel’s hometown. For the first time ever at a British Juggling Convention, I would have the option of a comfy bed at my Mother-in-Laws house just a 30min drive away! We still packed a tent and used it to occasionally sleep over and to operate from during each day. The passes are my favourite ever! The Buff came with an instruction sheet on how you could wear it. 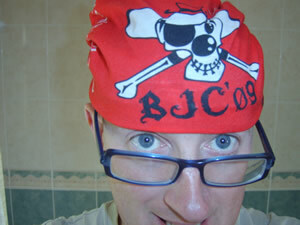 I used it as a bandana, but many others used it as a bracelet or tied it to their juggling bags. Some very skinny hula hoop girls even wore it as a top! At this convention, I wanted to try and improve my cigar box repertoire, learn the Levistick, and improve my 3 balls in one hand juggling. I managed to achieve all 3 goals woohoo! This is the Juggling Club I have attended since relocating from Scotland last year. They are based in Milton Keynes and they had a decent turnout at this Convention. You can find out more about this posse by viewing the page I created for them Milton Keynes Jugglers Anonymous. I didn’t realise that there was an even closer juggling club to my home in Rushden. I met the organisers of Corby Juggling Club when they teamed up with the MK posse for a team photo at the end of the Convention. I look forward to trying out their club soon! Learn to Teach Poi A useful class. I learned the 5 beat weave as well as many useful techniques for how to improve my teaching of this skill. Levistick by Andy Awesome! Very easy prop to get the hang of, but difficult to make it look easy and natural. I went to 2 x Levistick workshops and bought a couple of Levisticks so I can keep on practicing and teach it at my Workshops! 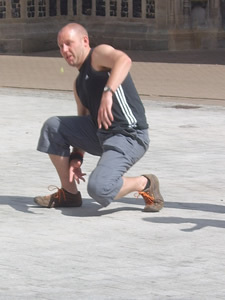 3 Ball Body Moves by Jon Peat Very well thought out workshop from one of the finest young jugglers in the Country. Excellent handout and a great new way to think about creating moves. Hats Workshop by Haggis McLeod I will need to buy a hat (size 58) soon to continue learning the many tricks that Haggis taught in this fantastic workshop. An excellent teacher whose DVDs are available from my online store! Lasso (Beginners) by Peter By the end of the hour, I was able to do the basic rope circle trick. This is another prop I will now need to buy! I currently sell a €œLasso Bible Lessons book which I can do some routines from if I master this prop! Devilsticks Intermediate I worked on the Propellor/Buzzsaw walkaround as well as some traps from helicopter spins. Sarah Bizkup borrowed my IPod so that she could use a song by the Fray “How to Save a Life” to her routine in this show. There were 12 acts in total, 4 of which got the silver award including Sarah. The winner was Reuben who possibly got more votes than everyone else combined! He had a fantastically well synch’d routine to a “popcorn” fast paced song. Rachel’s favourite act was the Notorious B E N who did some hip-hop diabolo. The best trick award was won by someone who balanced a pen on his nose (very difficult trick)! Most of the routines were well thought out and had a decent plot to them, but sadly no acts won the Gold award which prompted a lot of discussion afterwards about just how good an act would have to be to win this Gold award as no-one has ever won it, yet we saw some acts tonight that would have easily been good enough for the Public Show! 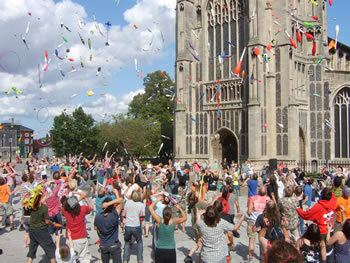 These took place in Norwich Town Centre outside the Forum Shopping Centre. It was a perfect location and the weather was fantastic! 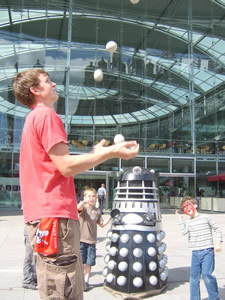 We were right beside the Anglian BBC HQ and there was a few Torchwood Stars making an appearance later that day, so there were a couple of Daleks roaming around all the other jugglers heckling us! catching a grape in the mouth tricksfest! 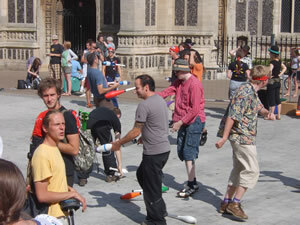 The host made sure that there were enough fun games that non-jugglers could join in as there were plenty of public spectators. Congratulations to everyone who organised this excellent games session! Mini organised this for the Sunday morning to discuss this years convention. 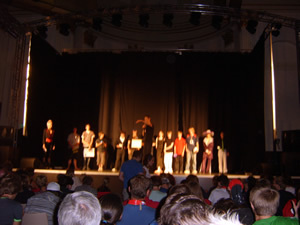 The team were thanked for being able to reorganise this convention once the original venue fell through. – THANKS! BJC 2010 was voted as being in Huddersfield which is just as well because the team have already done an immense amount of work in planning for it!